I am an Associate Professor at the Technion, and head of the Biology Education and Science Communication research groups at the Department of Education in Science and Technology. I am a member of the Learning in a Networked Society (LINKS) Israeli Center of Research Excellence (I-CORE). My background consists of academic research in the fields of science education, science communication and the active communication of science in the print and broadcast mass media. I completed my Ph.D. in 2007 at the Weizmann Institute of Science with Prof. Anat Yarden and have served as a faculty member at the Technion since 2008. I spent 2010 at Cornell University, N.Y., studying Science Communication with Prof. Bruce Lewenstein. I have founded the annual Israeli Science Communication Conference and currently I am the chair of the conference’s academic committee. Increased interest in public engagement with science worldwide has resulted in the growth of funding opportunities for scientists in the rapidly expanding field of citizen science. This paper describes a case study based on interviews and observations, including a six-month field diary, of ten scientists who engaged in a citizen science project to receive funding for their scientific research. It examines how these scientists perceived their commitment to the public, and it explores relationships between the ways that citizen science is defined and presented in the literature and the ideas that scientists in this project have about citizen science. The findings indicate that these scientists were motivated mostly by their interest in promoting scientific research and obtaining prestigious funding. Many of the scientists also found it difficult to accept the idea that the public can make actual contributions to science. Although the scientists acknowledged the advantages and benefits of citizen participation for the public, they had no desire to actively engage with the public and would rather conduct a traditional study without the public’s involvement. Exposing scientists to public engagement and citizen science concepts, especially at early stages of their scientific carrier, could help overcome barriers and encourage scientists to further engage the public in such initiatives. Given the growing number of citizen science projects and publications based on their results, combined with the many grant and project calls that incorporate citizen science components, identifying the positions and views of scientists who turn to such projects is important. This paper focuses on perceptions of public engagement by a group of scientists involved in an international European FP7 project for the development of sensor-based citizens’ observatories. It examines the ways that scientists who engaged in a citizen science project perceived their commitment toward the public in light of the project funders’ demands. It further explores the relationship between the way that citizen science is defined and presented in the literature and the ideas that scientists who engaged in the project have about what citizen science is and what it could be. Public engagement in science, citizen science, and other scientific public participatory activities have been on the rise in the past ten years (Rauws 2015). With positive outcomes for science, society, and individuals (Shirk et al. 2012), citizen science has become popular among many scientists, especially in the fields of ecology and environmental sciences (Dickinson et al. 2012; Follett and Strezov 2015). Many research funding agencies, such as the US National Science Foundation (NSF) and EU programs (e.g., Horizon 2020) have increasingly incorporated public engagement into their scientific funding goals, increasing the number of citizen science projects funded by the agencies (Andersson et al. 2015). Nevertheless, many scientists remain skeptical or unaware of the potential of citizen science (Engel and Voshell 2002). Getting more scientists engaged in citizen science is a key factor in advancing the field and creating significant impact on science, policy, and conservation efforts (Follett and Strezov 2015; Theobald et al. 2015). Hence, we need to understand scientists’ attitudes toward citizen science, examining their reasons for participating and their personal and professional points of view about the practice. One way to develop this understanding is to study scientists who have embraced citizen science, acknowledging its usefulness and recognizing its potential to create reliable scientific data. Another way is to examine the views of scientists who choose not to engage in citizen science, illuminating their reasons and the limitations of citizen science that they perceive. Following the second approach, this paper looks at scientists who are not convinced that citizen science is helpful for science but who find themselves involved in a citizen science project for funding reasons. The series of events that brought us to study this group of scientists is critical for understanding the overall context of the paper. In July 2014, project leaders, scientists, and engineers who had recently been awarded a grant to conduct air quality research that would involve and empower the public participated in an initial planning meeting. The meeting included local researchers who were part of a multinational, multi-institutional project with goals for science, technology, public engagement, and public participation. For the grant proposal, different experts had contributed different sections and had been involved in different workpackages. While the project coordinators had an overall project picture and vision, the scientists and engineers who attended the meeting stayed for the most part in technological silos, uninterested and to some degree unaware of the project’s public participation components and the affects that these components might have on their scientific work. The gap between the views that some of these scientists expressed, and the views of the two attending authors regarding citizen science, was strikingly apparent. This led us to conduct a case study of ten scientists involved in this project to examine their perceptions toward the public and public participation in science. Our study included comparing their perceptions of citizen science with descriptions of citizen science found in the literature, and we begin with a review of that literature. 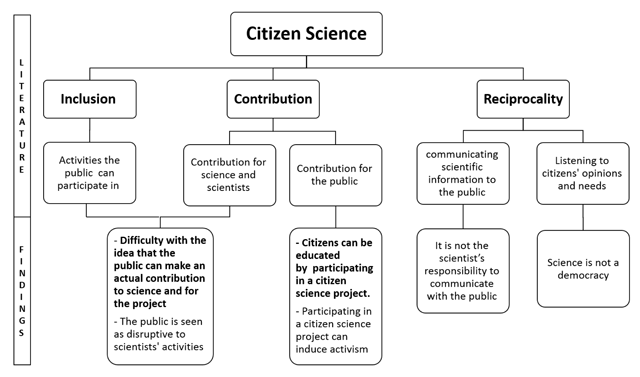 To identify the fundamental elements that formulate citizen science projects, we reviewed many citizen science conceptual and review publications (e.g., Bonney et al. 2009; Cox et al. 2015; Dickinson et al. 2010; Franzoni and Sauermann 2014; Haklay 2013; Haywood and Besley 2014; Shirk et al. 2012; Wilderman 2007). We used our review to build a model of the main features of citizen science which incorporates three fundamental elements: 1) Inclusion of citizens in the scientific process; 2) Contributions to both science and the public, and 3) Reciprocality, that is, two-way communication between scientists and the public. These elements and their sub-elements are summarized in Figure 1 and briefly described here. The essence of citizen science lies in the active participation of citizens in the scientific research process. Levels of participation can vary, starting from the simple contribution of information in contributory projects, through collaborative projects having the additive value of data analysis and interpretation, through co-created projects that involve the public in all stages of the research process (Bonney et al. 2009). Projects also can be classified according to participants’ level of inclusion and initiative based on who defines the problem, sets the agenda, designs the study, collects the samples, and analyzes the data (Haklay 2013; Wilderman 2007). Projects involving extremely simple tasks, such as providing computing resources and carrying sensors, have been described by Haklay (2013) as crowdsourcing. Collaborations between professional researchers and the general public have been shown to benefit science, the environment, society, and government (Science Communication Unit & England 2013; Shirk et al. 2012). The main advantages for science are new scientific findings. These are generally achieved by data collection and analysis by volunteers, which is especially significant in large-scale research projects that require gathering large amounts of data over wide geographic areas (Dickinson et al. 2010). Citizen science also helps to detect rare phenomena (e.g., species or unexpected findings) that might have been overlooked by scientists due to the predetermined course of study or lack of resources (Losey et al. 2012). The benefits for the public include acquiring new skills and knowledge, hands-on understanding of scientific processes, and a sense of achievement and pleasure in individual contribution to science (Brossard et al. 2005; Raddick et al. 2009). Citizen science also can impact society as a whole, raise awareness and involvement in social and environmental issues, influence policy makers and legislation, and change public attitudes and behavior toward science in general and in specific scientific fields (Ballard et al. 2017; Forrester et al. 2017; Overdevest et al. 2004). Citizen science can potentially serve as an important factor in science communication and in raising public understanding of science (Riesch et al. 2013). This can be achieved with the mutualistic nature of citizen science as citizens and scientists work together toward a common goal (Dickel and Franzen 2016). Scientific data and findings can be communicated to participants through projects blogs, forums, and Facebook pages, which also serve as platforms for participants to discuss their findings, raise new questions, and interact with scientists (Golumbic 2015; Jackson et al. 2016). Bonney et al. (2015) discuss the ability of citizen science to contribute to democratizing science and promoting a two-way dialogue between citizens and scientists. This dialogue, also termed as Public Engagement with Science (PES), emphasizes democratizing science, determining public desires and needs, encouraging transparency, and encouraging collective decision making (Brossard and Lewenstein 2009). In Haywood and Besley’s (2014) deliberative approach to citizen science, the authors combine elements of both science education and science engagement with science. This deliberative approach is claimed to increase mutual trust, contribute to the understanding of scientific research and its importance and relevance to life, and help direct the course of the study to the needs of society. While numerous studies have examined scientists’ attitudes toward science communication, public understanding of science, and public engagement with science and technology initiatives (e.g., Besley 2014; Burchell et al. 2009; Davies 2008; Peters et al. 2014), only a few studies have examined scientists’ views in the context of citizen science. The study on the Open Air Laboratories (OPAL) in England by Riesch et al. (2013) examined scientists’ attitudes toward citizen science directly. The findings suggest that scientists involved in OPAL perceive public participation as a main component and goal of their project. Nevertheless, they question the ability of lay citizens to supply products of adequate scientific quality. Much more has been published in the broader context of scientists’ views toward public engagement. These studies provide insight into scientists’ reasons for engaging with the public, the types of outreach activities that scientists generally engage with, and the willingness of scientists to actively engage the public in science reaserch. In one study, biosciences and biomedicine scientists in England had a tendency to aggregate a wide variety of activities into the realm of public engagement including working with the media, giving public lectures, talking at science festivals, writing popular science books, giving talks in schools, and working with policy and decision makers (Burchell et al. 2009). A survey conducted by the Royal Society (the independent scientific academy of the UK) examined the views and experience of UK scientists and engineers with regard to public engagement and science communication (Royal Society 2006). The most important reason that survey respondents engaged with the public was to ensure that members of the public were better informed about science and technology, followed by the desire to raise public awareness of science. Similar results were found in a series of group discussions with scientists and engineers in the UK conducted by Davies (2008). These discussions revealed that scientists became engaged in science communication activities to educate the public and to increase public awareness of the many advantages of science. Besley et al. (2013) examined two large-scale surveys of scientists conducted in the UK and the US and found that scientists who hold deficit model views of science education (which claim that more scientific knowledge will lead to more positive attitudes and acceptance of science) are more likely to see outreach as important and to participate in engagement activities. Besley and Nisbet (2011) found that scientists in the UK and US believe they should play a role in public debates but view policy makers as the most important group with whom to engage. These authors further emphasize that scientists need to educate the public to ensure that non-experts make policy choices in line with the views of scientists. Peters et al. (2014) conducted a large study including scientists from the United States, Japan, Germany, the United Kingdom, and France and showed that scientists welcome the involvement of non-scientists if they support scientists’ goals. Mizumachi et al. (2011) studied young Japanese scientists’ motivations and obstacles to publicly communicate science. These researchers identified five factors that account for the reluctance of scientists to take part in science cafés: 1) The work is troublesome or time consuming; 2) Scientists feel that they may not be good representatives of science; 3) engagement is outside the scope of their work; 4) scientists perceive no benefit; and 5) scientists are apprehensive about dialoguing with the public. Scientists who speak positively about communicating with the public tend to perceive this communication as a one-way transfer of information in which members of the public become educated (Cook et al. 2004; Davies 2008). Although many scientists are in favor of increasing the transparency of science, they do not necessarily support the active participation in its creation (Peters et al. 2014). Interestingly, while the citizen science literature calls for reciprocality, our review suggests that what often accounts for the involvement of scientists is a deficit model view. Because citizen science addresses a form of public engagement involving active participation in science, it is important to examine scientists’ views in this specific context. This study was conducted in one of the major universities in a non-English speaking country that is a member of the Organisation for Economic Co-operation and Development (OECD). We studied scientists who were involved in an ongoing citizen science initiative as part of a EU FP7 project, to which the scientists received a grant for improving the quality of life in cities. The name of the specific project is anonymized owing to ethical considerations and will be referred to throughout this paper as the Air For All project (AFA). The main goals of AFA were to raise citizens’ environmental awareness, increase involvement in social environmental decisions, and obtain citizens’ feedback on the impact of the project. Throughout the project, sensors that continuously monitored local air quality were distributed in participants’ homes and public spaces in a neighborhood in proximity to the aforementioned university. Measurements were transmitted from the sensors to a central database for two purposes: 1) For participants to use for personal research regarding day-to-day life, identifying air pollution hazards and reducing exposure, and 2) For scientists to use for modeling air quality and examining the validity of a network of sensors. AFA researchers were divided into a number of working groups including project management, implementation of sensor technologies, and developing citizen observatories. Each working group also had an ongoing emphasis on public empowerment and participation. For example, the working group on “implementation of sensor technologies” had tasks regarding the implementation of monitoring networks models (scientific/technological role) alongside identifying stakeholders and potential users (citizens, public authorities) who would be interested in the information and inviting them to provide input on information of interest. We examined the perceptions and views of the group of respected and globally renowned scientists involved in AFA who were members of a number of the AFA working groups. Specifically, we interviewed ten scientists (faculty, staff, and graduate students, seven men and three women) affiliated with the Faculty of Environmental Engineering. The scientists had previous professional interactions and had been involved in the AFA project from several months to two years at the time of the study. However, none of the scientists had previous experience in a public participation project. For purposes of data analysis, the scientists were divided into project leaders and assistant scientists based on their role in the project and their academic rank. In general, project leaders were staff members, including Principal Investigators, lab managers, and research associates, while assistant scientists were MA and PhD students. The socio-demographic characteristics of the participating scientists at the time of data collection are shown in Table 1. Demographic characteristics of the scientists interviewed. Note: pseudonyms were used to preserve the interviewees’ privacy. The main methods used for this study were personal interviews and participant observations (Gunn and Logstrup 2014). We chose to conduct qualitative research because of its exceptional data richness and ability to provide deep insight into the practices, motivations, and attitudes of the group of interest. The participant observation method provides access to backstage information; enables researchers to interpret behaviors, intentions, and situations; and provides opportunities for viewing and participating in unscheduled events (Kawulich 2005). Potential for bias via personal interpretation was controlled by performing cross analysis by two independent analyzers (described in “data analysis”), which strengthened the validity of the findings. Data collection consisted of participant observations between November 2014 and April 2015 and a series of twelve semi-structured interviews of AFA scientists. Of these, ten interviews were conducted between November 2014 and February 2015 and two additional interviews with two of the project leaders were conducted in November–December 2015. All data were collected by the first author. Interviews. During the interviews, scientists’ views toward the public, public engagement, and citizen science were examined. The interviewees were asked to describe how they would define success of the citizen science project they were involved in and state the advantages and disadvantages of public participation in their research. The interviews lasted about one hour each and were conducted in the scientists’ offices, labs, or other locations on campus. All interviews were recorded, transcribed, and qualitatively analyzed for emerging themes (described in the next section). A translated version of the interview protocol can be found in the supplemental material. Participant observation. During the six-month period of the participant observation (November 2014 to April 2015), the first author participated in ongoing activities of the AFA project. These included nine AFA scientist meetings (three with project leaders and six with assistant scientists), three public outreach planning meetings, and dozens of informal and internal conversations as well as email correspondence. Notes and thoughts were recorded in a field diary, which was used as supplemental data and as a tool to assist interpretation. All the materials, including interviews, internal documentations, notes from the participant observations, and the field diaries, were written in the local language. Interviews were fully transcribed and relevant sections translated into English. Quotations throughout the paper originate from interviews, internal documentations (such as the project call, study proposal, and project deliverables), and the field diaries. This triangulation of data served to draw conclusions and reinforce individual findings. Although the first author is affiliated with a different faculty, she had professional relationships with the ten AFA scientists and led many of the science engagement initiatives throughout AFA. The fourth author was part of the group of ten scientists under study and served as a member validator: He read the analysis of the interviews and field diary and provided insider insights to balance subjectivity and increase the validity of the analysis (Koelsch 2013). The objective of the analysis was to discover the ideas the scientists hold about what citizen science is and should be and to compare these ideas with the ways that citizen science is defined and presented in the literature. The interview transcripts were thematically analyzed by the first and second authors, in the local language, in a two-step process (Attride-Stirling 2001; Guest et al. 2011). First, each researcher read the transcripts and searched for dominant themes and sub-themes. Then a comparison was made between the themes that emerged from the text and the semi-structured list of topics that was compiled from the descriptions of citizen science in the literature (inclusion, contribution, and reciprocality). We then performed these same two stages in concert, to make sure that the texts were seen eye-to-eye and to strengthen the fidelity of semantic meaning and thus the validity of our findings. The unit of analysis, the smallest segment of text analyzed, was a full sentence. The data presented as examples in the results section represent the common and most substantial themes that appeared throughout the process of analysis. An IRB approval was obtained in November, 2014 from the authors’ institutional committee. The approval covered interviews with AFA scientists, observations and recordings of ongoing meetings with scientists about research progress and public participation methods, and documentation of informal discussions with scientists. The AFA scientists all expressed their full consent for the academic use of the data. All names were anonymized, and male and female names were used randomly to maintain participants’ privacy. As explained in the introduction, the complexity and multiple expertise involved in this multinational project created a situation in which scientists and engineers who were involved in the project were not fully aware of the role that public participation was supposed to play in their scientific work. This situation allowed us to study the ways in which the attitudes of scientists who are not already commited to public participation develop and unfold in a citizen science environment. This is highly relevant, because the new work plan for Horizon 2020 puts even more emphasis on intertwining public participation into science engineering based on its Responsible Research and Innovation Framework, so we could expect to see more situations like this in the near future. Later, when asked specifically about the public engagement aspects of the project, John said “I was completely unaware of the whole issue of public engagement.… In fact, during the first year or two of the project, the whole story was completely hidden, everyone was concentrating on the [air quality] sensors.” Amanda explained that although she was aware that the EU’s FP7 call for proposals emphasized citizen science and public engagement, she thought that she and her research group could concentrate exclusively on the technological aspects of the project, leaving public engagement to other partners. It was only in the middle of the process that she and her colleagues realized they had to engage with the social aspects of the project as well: “We understood later that the coordinator was required to include citizen science in our work package; in other words, the implementation [of air quality technology] would have significant components of citizen science.” For readers who have not had the experience of being part of a huge consortium with more than 20 partners, this might seem to be a manipulative answer. However, those who have had such an experience can understand how different work packages may not include certain goals of the project in their specific work plan. Thus Amanda and John, who wrote and submitted large parts of the AFA grant proposal, had no special interest in its public engagement features. Although all of the project work packages clearly contained elements of public participation, the scientists were not fully aware of their role in public engagement until a fairly late stage. Their primary interests were the scientific and technological aspects of the work and receiving funding for air quality research. Our literature review identified three main elements of citizen science—inclusion, contribution, and reciprocality—and the views voiced by the AFA scientists regarding citizen science can be divided along similar lines, assigned to their personal interpretation of each of these elements. Our finding in each of these categories are summarized in Figure 2 and followed by a detailed description. Citizen science as viewed by the literature and the AFA scientists. Themes with high consensus among scientists (eight or more) are presented in bold. Inclusion and contribution to science were found to be parts of separate elements of citizen science in our literature review. However, in the eyes of the AFA scientists, inclusion and contribution to science were intertwined and hence difficult to separate. Thus, our findings from these two element are combined here. A few months later, in one of the project meetings (which is described in the field diary), while discussing the primary results of the air quality data, Aaron further explained that one can only really learn something from the data if they are analyzed professionally. Aaron explained that putting data on a graph and looking at trends is not scientific. Before drawing conclusions, one needs to calculate standard deviations and conduct statistical analyses. In his view, this is something the public, which does not have a formal scientific education, simply cannot do and hence does not need to have access to the data. On the other hand, Tim, an assistant scientist, replied regarding public participation: “Definitely not with choosing the equipment [for monitoring air quality]. Yes, I think in planning the deployment [of air quality sensors] … in fact, what else is there?… We won’t let them analyze results, that doesn’t seem reasonable.” While Tim mentioned some type of active participation of the public, both Bob and Aaron had difficulty in accepting the public participation concept and questioned the ability of the public to make a real contribution to the scientific process. The expression of public participation in the project, in the eyes of the scientists, is illustrated in an internal deliverable document directed to project funders, specifying the significance of public engagement: “Engagement of stakeholders, scientists, public is important to be able to achieve the tasks we set ourselves.” In yet another deliverable document, the AFA scientists discuss sensor deployment: “These sites were chosen with partial public participation. In other words, we engaged with people who live in areas pre-selected for deployment who expressed interest in having such units on their premises.” In the words of George, an assistant scientist: “The public is a major part of this study, because most of the sensors are located in the public’s homes.” Similarly, Rebecca, an assistant scientist, explained that the citizens involved in the project “contribute space in their homes for data collection.” In fact, at least six scientists specifically stated that the biggest contribution the public could make is by simply placing sensors in their homes. The options for citizen participation acknowledged by AFA scientists limit public inclusion to such an extent that it is not clear if the project can be considered citizen science. The scientists were clearly interested in obtaining the data transmitted automatically from the sensors and felt that hosting sensors represented the public’s contribution to the study. Participants were not asked or consulted about the sensor distribution or location but rather contacted if they lived in appropriate areas. Thus, public engagement emerged as important in scientists’ views to achieve their own science-related goals. To sum, for all the participating scientists, the primary value of citizens’ participation is their contribution to scientists’ work. Most scientists described this contribution as hosting sensors in their homes with little or no active participation. Eight of the ten participating scientists visioned citizen contributions as having scientific benefit. Little value was ascribed to policymaking or social benefits. Many of the scientists (eight out of ten) viewed their role as educators of the public and saw public participation as an opportunity to educate the public about science. Some scientists thought that public participation, especially for children and teenagers, can have long-term educational benefits. Thus scientists see public participation as a means of educating the lay public about science and the scientific process. They further believe that promoting scientific knowledge among the public will have beneficial applications or outcomes for the participants (e.g., as described by George: “Capability to understand what is right”) and for the scientific community (e.g., people will decide to pursue science as a career). John, Rebecca, and two other scientists noted another important contribution of citizen science. Rebecca explained: “People will gain awareness … like you said, objective [information] on what is happening with the air around them. They will be able to understand what is needed and then they can put pressure on academia, and on public representatives to take steps … to improve the air quality in the area.” Similarly, John stated that: “I would like to see the public do something … I mean, if I give them a map and you can see a bus station right next to a kindergarten, I would expect parents would go knock on doors, to move the station 50 meters… Yes I would like, more users … active actions.” Aaron similarly claimed that “Because [the public] are exposed to this information, so let’s say they will lobby to move bus stations, change converters [catalytic converter] on the buses… Because in the end if the public is exposed to the real information, the power of the public exists.” These comments illustrate scientists’ views of citizen science in promoting activism and leading wider policy change. In their view, participation in a citizen science project can prompt citizens to become more aware and active supporters of the environment and promote agendas that stem from or relate to citizen science initiatives. The scientists used the words “activism” and “actions” to describe what they saw as the chief outcome of public participation; utilizing knowledge for political and civic action. Illustrating these comments was the challenging experience the first author (who was responsible for public communication in the project) had in bringing scientists to engage with the public by attending public meetings or writing posts for the project blog. The scientists stated that they had more important things to do, and that they are paid to produce scientific findings and not to communicate with the public. This stance was echoed by all five project leaders (see Table 1), who agreed that science communication was not within the scope of a scientist’s job. However, assistant scientists had different perceptions toward their relationship with the public, as noted by George: “It is definitely the scientist’s responsibility…. A good scientist considers it important to disseminate … his knowledge.” Furthermore, as Dale said: “I don’t think there is much point in research if it is not, I mean, if in the end it does not serve the public.” And Sam stated that: “This is not just cost and benefit for me, it is also cost and benefit for the public … that the public will be able to use my work, or I will be able to orient my work in the direction of what the public wants while … without risking it.” Sam, Rebecca, Tim, Dale, and George, unlike the project leaders, did not consider their relationship with the public as a burden or as a waste of time. Rather, they found it very important and considered it to be an integral part of a scientist’s responsibility to society. The assistant scientists viewed engagement with citizens as a valuable asset for both the public and scientists. The scientists perceived communicating with the public as a difficult task they are not trained for, and that if done inadequately may be misunderstood or misleading. It could further have negative consequences for their research and reputation, which is not worth the risk. Furthermore, if the science presented to the public contradicts their views, members of the public will simply disregard the scientists’ explanation and maintain their original beliefs. Considering the potential for citizen science to increase public engagement with science as indicated by Haywood and Besley (2014), we asked scientists how they viewed this process. To this, Sarah, a project leader, replied: “Do we need to consider what [the public] wants? I don’t know … I am not used to thinking in these terms.” John further stated: “I also oppose the approach that says let’s ask the public what interests them and what their needs are … what you call “let the public direct science. The public cannot direct science.” Amanda, explaining her view on public engagement, said: “I think that democracy in science, or democracy in anything that is knowledge based or requires professionalism … there is also some kind of problem. People’s voices can’t be equal.” For these scientists, considering the public’s opinion was an unfamiliar concept that could and should not be a main consideration. In terms of the power relations between the scientists and the public within the framework of the project, the scientists clearly stated that they should be the ones to decide upon the topics to be studied. Scientists additionally stated that similar to other disciplines, science is not a democracy and should not become one. Some scientists had additional concerns regarding public engagement as illustrated by the following event (described in the field diary), which took place during an internal project meeting in the early stages of the study (before most of the interviews had been conducted) concerning the public’s role in the project. John, one of the project leaders, acknowledged that he is not interested in working with the public, explaining his unwillingness with the following words: “The public gets in my way.” Sam, an assistant scientist, talking about his fellow project leaders explained these views during his interview: “[The project leaders] need to work with a clear mind, [they] don’t need someone on the sidelines to disturb them, criticize them, [someone] who is outside of their community.” This stance, of seeing the public as disruptive for the study, was repeated by at least five of the scientists interviewed. They not only believed that the public’s ability to contribute was minimal but that the public could interfere and deplete precious resources. Overall, scientists found it difficult to accept the idea that the public can make an actual contribution to science. They viewed the public’s main contribution as the manpower to execute scientists’ ideas according to prescribed inquiry methods and saw the biggest contribution the public could make as simply placing sensors in their homes. Some of the scientists even saw the public as disruptive to scientists’ activities. The scientists agreed that the public could benefit from participation and suggested that the two main ways were through education and activism. Thus, scientists saw public participation as a means of becoming educated about science and the scientific process, and believed that promoting scientific knowledge would have beneficial applications and outcomes for both the participants and the scientific community. Some of the scientists considered another chief outcome of the project to be “activism,” which means members of the public utilizing new knowledge for political and civic action. Despite these potential outcomes, the project leaders did not think it was their responsibility to communicate science to the public. Nor did they believe that they needed to listen to the public’s views and needs (“science is not a democracy”). Finally, all of the scientists agreed that the public is not adequately informed about science, because the main source of scientific information is the media, which is unreliable. This situation affects citizens’ perceptions about science, prevents them from seeing the whole picture, and makes them unable to form a “real” opinion. This study aimed to examine the ways that a group of scientists engaged in a project with a strong public participation aim perceive their commitment toward the public, and to explore the relationship between the way that citizen science is defined and presented in the literature and the ideas about public engagement expressed by these scientists. What is interesting about this sample is the opportunistic way in which they found themselves engaged in a citizen science project, without a strong prior commitment that might characterize scientists in former case studies. It is an important group to study because the new funding framework Horizon 2020 emphasizes even more the inclusion of such activities in the work of scientists whithin the Responsible Research and Innovation (RRI) framework (Rask et al. 2016). This framework envisaged science and innovation as being directed towards socially desirable objectives, through an inclusive and deliberative process (Owen et al. 2012). This means that in the near furture more scientists without commitment to citizen science, but with great interest in funding their research, are likely to be involved in such projects. Our findings indicate that scientists’ motivations were primarily to promote scientific research, obtain prestigious funding, and publish scientific papers. Despite the project’s original emphasis on public engagement, the scientists involved were not committed to the public but rather only to advancing science. This is of special significance in light of the increasing number of calls for scientific projects with a distinct public engagement component. Our findings revealed a gap between the way that citizen science is defined and presented in the literature and the perceptions of citizen science by AFA scientists. In particular, the findings illustrate the scientists’ reluctance to accept the idea that the public can make an actual contribution to science. They see public participation as “the power of the crowd,” where few people actually have the ability to contribute, and the vast majority simply act as potential locations for sensor deployment. These finding are in agreement with Riesch and Potter (2013) who found that OPAL scientists questioned the ability of citizen science to contribute to science owing to low perceived data quality. Although most of the scientists in our study acknowledged the advantages and benefits of citizen participation for the public (such as education and activism), they expressed no desire to actively engage with the public and preferred to conduct a traditional study without public involvement. This is due largely to the fact they do not see themselves responsible for the public or its wellbeing. Furthermore, working with the public demands resources and is time consuming and therefore interferes with their scientific work. Clearly the motivation of AFA scientists for involvement in this project was a main factor in their interpretation of the term citizen science. Scientists who actively take part in citizen science initiatives make an informed decision to participate in such projects. However, the reasons for joining such a project may vary, influencing the scientists’ views towards citizen science and public engagement. In the case of scientists involved in OPAL, motivations may be to specifically promote public engagement, as the scientists expressed their strong support for a more publicly engaged type of science (Riesch et al. 2013). However, when drawn into a project by grants and external requirements (such as in the current project), the motivation is external and therefore views about the importance of public engagement and what citizen science is about may differ. This is further supported by the difference found here between project leaders and assistant scientists regarding their responsibility toward the public. While the project leaders are the ones who made the active decision to submit a proposal for this project, emphasizing the funding and professional opportunities, the assistant scientists had a positive attitude towards the public and did not feel that communicating with them was a waste of time. How to encourage scientists to participate in public engagement activities is still an unanswered question (Salmon et al. 2015). However, a number of studies have suggested that scientists’ motivations include the drive to enhance the public’s positive attitudes toward science, increasing public awareness of scientific concepts, and convincing the public of the importance of the scientists’ role (Besley et al. 2013; Davies 2008; Martin-Sempere et al. 2008). These motivations are consistent with our findings and are compatible with the “deficit model,” which considers scientists responsible for transmitting their knowledge and educating the public (Brossard and Lewenstein 2009). The implications of scientists’ retaining the deficit model are maintaining a distinct dichotomy between citizens and scientists, prevention of further public engagement, and exclusion of the public from the scientific dialogue (Simis et al. 2016). The aspiration of citizen science is to do the exact opposite—to include more voices in the creation of new scientific knowledge. Furthermore, the involvement of diverse publics in citizen science projects may contribute to reducing the inequity and mistrust often found in scientific research (Soleri et al. 2016). Illustrating this notion of involving many and diverse audiences is the use of the term “citizen scientists” referring to all participants in citizen science projects. One way to bring scientists involved in citizen science projects to consider more public involvement may be to enhance their intrinsic motivation to take part in it (Salmon et al. 2015). This could involve appealing to their moral compass or by underscoring the normative importance of citizen involvement. The Public Engagement with Science (PES) model suggests that there can be a mutual relationship and dialogue between scientists and the public and argues that both scientists and public benefit from listening to and learning from each other. Citizen science is one of the ways to implement PES in practice (Haywood and Besley 2014), but to promote a two-way communication model, all participants need to actively work toward public engagement. Promoting public engagement with science is not an easy task, and not a concept that scientists are generally used to thinking about (Davies 2008). Many of the AFA scientists acknowledged this, such as Sarah who said “I am not used to thinking in these terms,” and who perceived communicating with the public as a difficult task that they are not trained to do. The reluctance of AFA scientists to engage in a two-way communication model may be not so much objections but their lack of experience and familiarity with the PES model and its advantages. Exposing scientists to these ideas, though science communication training courses and though active participation in PES initiatives, could help overcome the barriers and encourage scientists to further participate (Brownell et al. 2013; Concannon and Grenon 2016). Furthermore, teaching young scientists science communication skills at an early stage of their training can inform their scientific identity and increase their communication competence (Baram-Tsabari and Lewenstein 2017; Brownell et al. 2013). We found a striking difference between young and established scientists in terms of their views and responsibility toward the public. Building on the willingness and commitment of young scientist for establishing relationships with members of the public could further promote public-engaged scientists. A number of studies have shown (Blok et al. 2008; Pearson et al. 1997) that following interactions with the public, scientists have more positive perceptions of the public and are more confident in forming relationships and engaging with the public over time. In addition, Poliakoff and Webb (2007) found that scientists who have previous engagement experiences are more likely to have future intentions to participate in public engagement activities. In the context of our study, it would be interesting to re-examine AFA scientists’ perceptions toward public engagement and citizen science as time goes by and the involvement of the scientists’ progresses in the project. Research limitations. The results and conclusions in this paper should be interpreted with caution given its limitations: The study conducted in-depth interviews with only ten scientists, and collected documentation and employed a field diary describing events in one citizen science project in one location. The findings cannot be generalized to other citizen science projects and scientists working in other locations. However, this study does provide a look behind the scenes into the world of incentives and motivations of scientists to participate in citizen science projects. It adds to the existing work examining public engagement from the scientists’ point of view, provides insights on the relationship between citizen science and public engagement with science, and offers some guidance for training scientists in science communication. The research further demonstrates that much work needs to be done to attract scientists to the field of citizen science. Our findings also have implications for the review process for citizen science, public engagement, and RRI proposals. Project proposers should have a clear idea of how to perform citizen science research (or public engagement and RRI) and should guarantee that scientists will be held accountable to the funder. Another limitation of this study may be the use of the participant observation method. It allows an in-depth view of scientists and the ways that they see and think about their project roles, but may limit our ability to generalize the data. Future research should expand to include comparative contexts, such as citizen science projects in different geographical or cultural contexts. Such overall perspectives have been investigated in the relationship of citizen science and informal education (Bonney et al. 2009) and quality assurance (Dickinson et al. 2010) but not in the context of scientists’ views. It would also be interesting to test the internal inconsistencies between vision and reality, found here among the scientists, using quantitative methods. This would serve for better methodological triangulation, for increasing the number of scientists participating, and for eliminating biases caused by qualitative interpretations. Such exploration could support empirically based recommendations for motivating scientists to be more involved in citizen science projects, in public engagement initiatives, and in encouraging scientists toward greater reflexivity (Salmon et al. 2015). This research was supported by the I-CORE Program of the Planning and Budgeting Committee and The Israel Science Foundation (1716/12). Andersson, E., Bussu, S. and Davis, H. (2015). Andersson, E., Bussu, S. and Davis, H. eds. Moving forward–The future of engagement. Science, Society and Engagement, An e-anthology, : 77–83. Bonney, R., Ballard, H., Jordan, R., McCallie, E., Phillips, T., Shirk, J. and Wilderman, C.C. (2009). Public participation in scientific research: Defining the field and assessing its potential for informal science education. A CAISE Inquiry Group Report, July 2009: 1–58. Brossard, D. and Lewenstein, B.V. (2009). A Critical Appraisal of Models of Public Understanding of Science In: Kahlor, L. and Stout, P. eds. Communicating Science: New Agendas in Communication. New York: Routledge, pp. 11–39. Brownell, S.E., Price, J.V. and Steinman, L. (2013). Science communication to the general public: Why we need to teach undergraduate and graduate students this skill as part of their formal scientific training. Journal of Undergraduate Neuroscience Education 12(1): E6–E10. Burchell, K., Franklin, S. and Holden, K. (2009). Public culture as professional science: Final report of the ScoPE project (Scientists on public engagement: from communication to deliberation?) In: London, U.K.: London Sch., p. 85. Dickel, S. and Franzen, M. (2016). The “Problem of Extension” revisited: New modes of digital participation in science. Journal of Science Communication 15(1): 1–15. Golumbic, Y.N. (2015). What makes citizen science projects successful, and what can we learn from them for future projects?. Technion Citizen Science Project (TCSP) report, : 1–56. Guest, G., MacQueen, K.M. and Namey, E.E. (2011). Applied Thematic Analysis. Washington, D.C.: SAGE Publications Inc..
Haklay, M. (2013). Citizen Science and Volunteered Geographic Information–overview and typology of participation In: Sui, D., Elwood, S. and Goodchild, M. eds. Crowdsourcing Geographic Knowledge: Volunteered Geographic Information (VGI) in Theory and Practice. Berlin: Springer Netherlands, pp. 105–122. Losey, J., Allee, L. and Smyth, R. (2012). The Lost Ladybug Project: Citizen spotting surpasses scientist’s surveys. American Entomologist, : 22–24. Mizumachi, E., Matsuda, K., Kano, K., Kawakami, M. and Kato, K. (2011). Scientists’ attitudes toward a dialogue with the public: A study using “science cafes.”. Journal of Science Communication 10(4): 1–11. Overdevest, C., Orr, C.H. and Kristine, S. (2004). Volunteer stream monitoring and local participation. Research in Human Ecology 11(2): 177–185. Peters, H.P., Dunwoody, S., Allgaier, J., Lo, Y. and Brossard, D. (2014). Public communication of science 2.0. EMBO reports: Science & Society 15(7): 749–753. Rask, M., Mačiukaitė-Žvinienė, S., Tauginienė, L., Dikčius, V., Matschoss, K., Aarrevaara, T. and D’Andrea, L. (2016). Innovative public engagement: A conceptual model of public engagement in dynamic and responsible governance of research and innovation. Public Engagement Innovations for Horizon 2020. Rauws, G. (2015). Public engagement as a priorty for research In: Edward Andersson, S.B. and Davis, H. eds. Science, Society and Engagement, An e-anthology. The Engage2020 Consortium, pp. 22–24. Royal Society (2006). Survey of factors affecting science communication by scientists and engineers. The Royal Society. Wilderman, C. (2007). McEver, C., Bonney, R., Dickinson, J., Kelling, S., Rosenberg, K. and Shirk, J. eds. Models of community science: Design lessons from the field. Proceedings of the Citizen Science Toolkit Conference. Ithaca, New York, USACornell Laboratory of Ornithology: 83–96.